What would you say if we told you Democrats have a plan to change the Constitution without going through the arduous process of amending it according to the process set forth in Article V of our government’s founding document? Well, get ready, because they do, and according to our friend Hans von Spakovsky, senior legal fellow at The Heritage Foundation and a former commissioner on the Federal Election Commission, their anti-Constitutional plan is gaining ground. Democrats have long opposed the Electoral College because with overwhelming margins of victory in high-population states like California they could dominate future presidential elections based on the popular vote, so they have concocted a plan to try to bypass the constitutional amendment process by constructing a multi-state compact to allocate their Electoral votes according to the popular vote. von Spakovsky says the movement going on in all 50 states is sponsored by the National Popular Vote, an advocacy group in California, that claims they can get rid of the Electoral College's effects by having the states agree to a state compact. 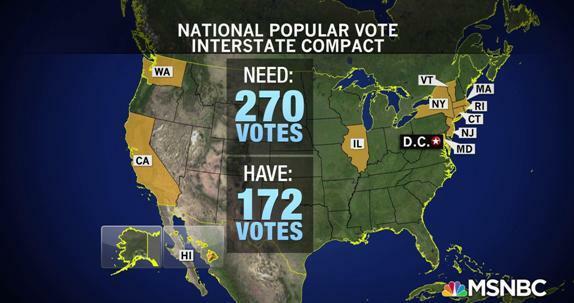 "The state compact they are pushing is for state legislatures to agree that in future presidential elections they will not award the Electoral College votes of their state according to whichever presidential candidate got the most votes in their state," von Spakovsky explained to Chad Groening of OneNewsNow.com. "Instead they would award their Electoral College votes to whichever candidate won the national popular vote." According to Groening’s analysis of the National Popular Vote website, 11 states (plus the District of Columbia) have enacted the law, representing 172 electoral votes: California, Connecticut, Hawaii, Illinois, Massachusetts, Maryland, New Jersey, New York, Rhode Island, Vermont, and Washington – all Democrat-controlled states. Colorado is expected to join this group soon, increasing that count by 40 to 181. Here’s the problem says Nate Silver of 538: All the states to have joined so far are very blue. Until some purple states and red states sign on, the compact has little in the way of territory to conquer. However, there are some Republicans, such as former Michigan GOP leader Saul Anuzis, who support the idea of the National Popular Vote compact. In fact, claimed Mr. Anuzis, a majority of states did not have state-based, winner-take-all laws until the eleventh presidential election, generations after the Founding Fathers were dead. So, he says, if you are defending the current system as “the Founders’ system,” honesty and history demand that you stop doing so. However, as the Heritage Foundation’s Tara Ross wrote in “The Electoral College: Enlightened Democracy,” the negative views of today's academics (and Democrats still stinging from Hillary Clinton’s defeat) are starkly at odds with the universal admiration for the system at the time it was created. Alexander Hamilton, for instance, publicly deemed the Electoral College "excellent.” Other delegates at the Constitutional Convention agreed with him: They viewed the Electoral College as one of the new Constitution's great achievements. Today's unenthusiastic views would almost certainly surprise these early patriots. As Ms. Ross documented, the Founders spent months of extensive deliberation on the topic of presidential election: They deemed it one of the most difficult issues facing the Convention. When the Electoral College proposal was completed, they viewed it as a unique and commendable solution that would satisfy the many -- apparently contradictory -- goals of the new republic. Contrary to modern perceptions, Ross noted, the founding generation did not intend to create a direct democracy. To the contrary, the Founders deliberately created a republic -- or, arguably, a republican democracy -- that would incorporate a spirit of compromise and deliberation into decision-making. Such a form of government, the Founders believed, would allow them to achieve two potentially conflicting objectives: avoiding the "tyranny of the majority" inherent in pure democratic systems, while allowing the "sense of the people" to be reflected in the new American government.27 Moreover, a republican government, organized on federalist principles, would allow the delegates to achieve the most difficult of their tasks: enabling large and small sovereign states to live peacefully alongside each other. The authors of the Constitution had studied the history of many failed democratic systems, and they strove to create a different form of government. Indeed, James Madison, delegate from Virginia, argued that unfettered majorities such as those found in pure democracies tend toward tyranny. Alexander Hamilton agreed that "[t]he ancient democracies, in which the people themselves deliberated, never possessed one feature of good government. Their very character was tyranny; their figure, deformity." Other early Americans concurred according to Ms. Ross’s research. John Adams, who signed the Declaration of Independence and later became President, declared, "[D]emocracy never lasts long. It soon wastes, exhausts, and murders itself. There never was a democracy yet that did not commit suicide." Another signatory to the Declaration of Independence, Benjamin Rush, stated, "A simple democracy . . . is one of the greatest of evils." The Electoral College was considered to fit perfectly within this republican, federalist government that had been created. The system would allow majorities to rule, but only while they were reasonable, broad-based, and not tyrannical. The election process was seen as a clever solution to the seemingly unsolvable problem facing the Convention -- finding a fair method of selecting the Executive for a nation composed of both large and small states that have ceded some, but not all, of their sovereignty to a central government. "`[T]he genius of the present [Electoral College] system,'" a 1970 Senate report concluded, "`is the genius of a popular democracy organized on the federal principle.'" In sum, the nation conducts democratic, popular elections -- but they are conducted at the state level, rather than the national level concludes Ms. Ross. Professor Charles R. Kesler of Claremont McKenna College explains: "In truth, the issue is democracy with federalism (the Electoral College) versus democracy without federalism (a national popular vote). Either is democratic. Only the Electoral College preserves federalism, moderates ideological differences, and promotes national consensus in our choice of a chief executive." We urge CHQ readers and friends to call their state legislators TODAY to tell them to oppose the National Popular Vote state compact or any effort to bypass the constitutional amendment process to defeat the purposes of the Electoral College system. Electoral College & a republican democracy? I don't think so! Submitted by Bobbrew on Fri, 03/15/2019 - 14:53. "or, arguably, a republican democracy"? Our founders eschewed the term democracy like the worst of plagues. What is Mr. Ross's argument to refute our founders? Submitted by email_registrat... on Fri, 03/15/2019 - 13:38.
constitutional crisis in your future, abandon the electoral college. way than the way these BLUE States envision this new procedure. Submitted by email_registrat... on Fri, 03/15/2019 - 12:04. 1. I can't believe the other 48 states would nullify their input into a national election. 2. If this succeeds we might as well just have presidential elections in California and NY.